Launched this summer, 55 metre Phinisi Prana combines luxury cruising with traditional boatbuilding and will be island hopping around Indonesia's eastern archipelago, sailing between Komodo National Park, the Banda Islands and Raja Ampat. Spread across four decks, she can sleep up to 18 guests in nine sumptuous cabins, including an upper deck master suite with 180-degree views and a private deck. Prana was commissioned by Ibiza-based boutique hotel Atzaro and so all cabins feature their signature tropical-chic styling, with king or queen-sized beds and rainfall showers. Other highlights include a yoga deck that doubles as a cinema under the stars, a spa, and a water sports deck where guests can pick up diving equipment and explore Indonesia's vibrant coral reefs, accompanied by an onboard diving instructor. Prana is managed for charter by Yacht Sourcing, and can be booked in its entirety or by individual suite. Full yacht charter rates start from $12,500 per night. 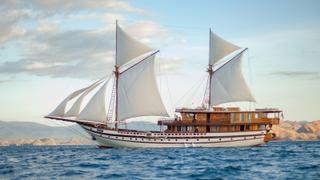 Launched this summer, 55 metre Phinisi Prana combines luxury cruising with traditional boatbuilding and will be island hopping around Indonesia's eastern archipelago, sailing between Komodo National Park, the Banda Islands and Raja Ampat. Spread across four decks, she can sleep up to 18 guests in nine sumptuous cabins, including an upper deck master suite with 180-degree views and a private deck. Prana was commissioned by Ibiza-based boutique hotel Atzaro and so all cabins feature their signature tropical-chic styling, with king or queen-sized beds and rainfall showers. Other highlights include a yoga deck that doubles as a cinema under the stars, a spa, and a water sports deck where guests can pick up diving equipment and explore Indonesia's vibrant coral reefs, accompanied by an onboard diving instructor. Prana is managed for charter by Yacht Sourcing, and can be booked in its entirety or by individual suite. Full yacht charter rates start from $12,500 per night. 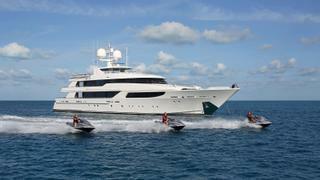 Delivered earlier this year, 36 metre motor yacht Sands has joined the charter fleet. Featuring classic Italian styling the yacht, which was built by Maiora, will be based on the Amalfi Coast. Sands offers accommodation for up to 12 guests in six cabins, including two equal sized VIP cabins on the main deck. Her flexible layout also offers a further two double and two twin cabins. All the cabins are equipped with the latest audio visual systems, including ultra high definition 4k TV screens. The yacht’s contemporary interior also has a large lounging area and dining area. There are further al fresco dining options and she also has an outdoor bar on the top deck, which is perfect for sundowners. She features a packed toy box, including Seabobs, kayaks, stand up paddle boards, and snorkelling and scuba diving equipment. She also has stabilisers both at zero speed and when underway to ensure comfortable cruising conditions. Sands is managed for charter by Camper and Nicholsons and her weekly charter rate starts from €110,000. 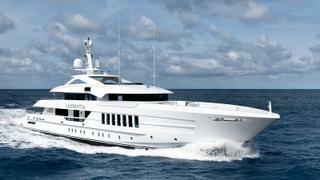 Delivered earlier this year, 36 metre motor yacht Sands has joined the charter fleet. 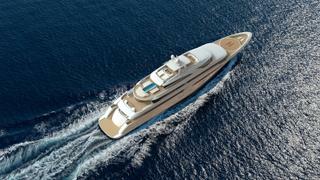 Featuring classic Italian styling the yacht, which was built by Maiora, will be based on the Amalfi Coast. Sands offers accommodation for up to 12 guests in six cabins, including two equal sized VIP cabins on the main deck. Her flexible layout also offers a further two double and two twin cabins. All the cabins are equipped with the latest audio visual systems, including ultra high definition 4k TV screens. The yacht’s contemporary interior also has a large lounging area and dining area. There are further al fresco dining options and she also has an outdoor bar on the top deck, which is perfect for sundowners. She features a packed toy box, including Seabobs, kayaks, stand up paddle boards, and snorkelling and scuba diving equipment. She also has stabilisers both at zero speed and when underway to ensure comfortable cruising conditions. Sands is managed for charter by Camper and Nicholsons and her weekly charter rate starts from €110,000. Launched in summer 2018, 72 metre Tankoa Yachts Solo made her debut at the Monaco Yacht Show and has joined Northrop and Johnson's charter fleet. She'll be spending the summer season in the Mediterranean and her winters in the Caribbean. Solo’s contemporary interior, designed by Margherita Casprini, sleeps up to 12 guests in six cabins. Her master suite features a private terrace and a Jacuzzi, while other guests can be accommodated in a large VIP, two double-bed cabins and two twin cabins. She features impressive outdoor spaces, which a seamless flow between indoor and outdoor living, as well as a vast beach club with a salon, bar, sauna and Hamman. She also has a skylounge after which has swimming pool and a touch-and-go helipad that can be converted into a dance floor. Solo is managed for charter by Northrop & Johnson, with a weekly charter rate starting from €595,000 per week. Launched in summer 2018, 72 metre Tankoa YachtsSolo made her debut at the Monaco Yacht Show and has joined Northrop and Johnson's charter fleet. She'll be spending the summer season in the Mediterranean and her winters in the Caribbean. 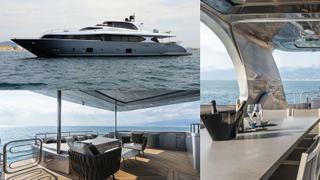 Solo’s contemporary interior, designed by Margherita Casprini, sleeps up to 12 guests in six cabins. Her master suite features a private terrace and a Jacuzzi, while other guests can be accommodated in a large VIP, two double-bed cabins and two twin cabins. She features impressive outdoor spaces, which a seamless flow between indoor and outdoor living, as well as a vast beach club with a salon, bar, sauna and Hamman. She also has a skylounge after which has swimming pool and a touch-and-go helipad that can be converted into a dance floor. Solo is managed for charter by Northrop & Johnson, with a weekly charter rate starting from €595,000 per week. Combining superb sailing performance with exceptional guest comfort, the newly-relaunched sailing yacht G2 (previously Cinderella IV) is the perfect vessel for a charter holiday in the Mediterranean this summer. Following an extensive rebuild, the 39 metre yacht boasts a light and contemporary interior by Nauta Yachts, with an open-plan saloon, oversized portholes and a central skylight over the main deckhouse for the ultimate indoor-outdoor cruising experience. Her new modern exterior by Tripp Design Naval Architecture offers plenty of room on deck to enjoy al-fresco dining, lounge in the Mediterranean sun, and on particularly hot afternoons, biminis can be set up to provide shade both at anchor and under sail. Delivered by Vitters in 2009 and rebuilt by Pendennis in 2018, G2 can sleep up to eight guests in a flexible cabin layout of three double staterooms and one convertible twin. Managed by YPI, G2 has a weekly summer charter rate starting from €85,000. Combining superb sailing performance with exceptional guest comfort, the newly-relaunched sailing yacht G2 (previously Cinderella IV) is the perfect vessel for a charter holiday in the Mediterranean this summer. Following an extensive rebuild, the 39 metre yacht boasts a light and contemporary interior by Nauta Yachts, with an open-plan saloon, oversized portholes and a central skylight over the main deckhouse for the ultimate indoor-outdoor cruising experience. Her new modern exterior by Tripp Design Naval Architecture offers plenty of room on deck to enjoy al-fresco dining, lounge in the Mediterranean sun, and on particularly hot afternoons, biminis can be set up to provide shade both at anchor and under sail. Delivered by Vitters in 2009 and rebuilt by Pendennis in 2018, G2 can sleep up to eight guests in a flexible cabin layout of three double staterooms and one convertible twin. Managed by YPI, G2 has a weekly summer charter rate starting from €85,000. Delivered in September 2017, the stunning 55 metre Heesen superyacht Laurentia was made available to charter in the Western Mediterranean from summer 2018. With a focus on indoor-outdoor living, her on-deck highlights include a spacious sundeck with sunpads, Jacuzzi and bar, while her main deck aft doubles as a day lounge and an al fresco cinema for movie nights under the stars. Below deck her cool and contemporary interior boasts a beautiful main saloon complete with plentiful seating, a chic dining area and a skylounge with floor-to-ceiling windows, bar, large television and seating area. Managed for charter by Burgess, Laurentia has a weekly summer rate starting from €350,000 in the low season and €371,00 in the high season. In the winter, she'll be heading to the Caribbean with a weekly rate starting from $357,000 in the low season and $399,000 in the high season. Delivered in September 2017, the stunning 55 metre Heesen superyacht Laurentia was made available to charter in the Western Mediterranean from summer 2018. With a focus on indoor-outdoor living, her on-deck highlights include a spacious sundeck with sunpads, Jacuzzi and bar, while her main deck aft doubles as a day lounge and an al fresco cinema for movie nights under the stars. Below deck her cool and contemporary interior boasts a beautiful main saloon complete with plentiful seating, a chic dining area and a skylounge with floor-to-ceiling windows, bar, large television and seating area. Managed for charter by Burgess, Laurentia has a weekly summer rate starting from €350,000 in the low season and €371,00 in the high season. In the winter, she'll be heading to the Caribbean with a weekly rate starting from $357,000 in the low season and $399,000 in the high season. Launched by Neta Marine early in 2018, 50 metre Meira is available to charter in the Eastern Mediterranean all year round. The motor sailer yacht has been designed inside and out by Evan K Marshall with naval architecture by Fuat Turan. Guests can relax in the main deck saloon, which features lounge and dining areas, or head to the spa area on the lower deck for a massage and to make use of the sauna. She can sleep up to 12 guests in six elegant cabins, which includes a master suite complete with private office, with accommodation for a crew of 10. Up on deck, charterers can relax in the Jacuzzi, which has a seated bar on one edge, in the lounge area or atop a sunbed to soak up some rays. There are also plenty of sunpads and al fresco dining spots. Managed for charter by Ocean Independence, she has a weekly rate starting from €105,000 in the low season and €133,000 in the high season. Launched by Neta Marine early in 2018, 50 metre Meira is available to charter in the Eastern Mediterranean all year round. The motor sailer yacht has been designed inside and out by Evan K Marshall with naval architecture by Fuat Turan. Guests can relax in the main deck saloon, which features lounge and dining areas, or head to the spa area on the lower deck for a massage and to make use of the sauna. She can sleep up to 12 guests in six elegant cabins, which includes a master suite complete with private office, with accommodation for a crew of 10. Up on deck, charterers can relax in the Jacuzzi, which has a seated bar on one edge, in the lounge area or atop a sunbed to soak up some rays. There are also plenty of sunpads and al fresco dining spots. Managed for charter by Ocean Independence, she has a weekly rate starting from €105,000 in the low season and €133,000 in the high season. Sold at the end of 2017 and made immediately available for charter, the 50 metre Westport superyacht Hospitality (formerly Wabi Sabi) can sleep up to 12 guests in eight cabins. Delivered in 2001 and refitted in 2016, Hospitality boasts an opulent interior that features gym equipment, a massage space, a spacious main saloon with plenty of cosy sofas, a dining area and a skylounge / study complete with fireplace, and a stunning office desk. Up on deck, guests can relax in a stunning cocktail lounge or enjoy a sumptuous feast at the al fresco dining table. Forward on the sundeck sits a spa pool with sunpads and an additional seating area. Managed for charter by Moran Yacht & Ship, Hospitality has a weekly rate starting from $195,000. Sold at the end of 2017 and made immediately available for charter, the 50 metre Westport superyacht Hospitality (formerly Wabi Sabi) can sleep up to 12 guests in eight cabins. Delivered in 2001 and refitted in 2016, Hospitality boasts an opulent interior that features gym equipment, a massage space, a spacious main saloon with plenty of cosy sofas, a dining area and a skylounge / study complete with fireplace, and a stunning office desk. Up on deck, guests can relax in a stunning cocktail lounge or enjoy a sumptuous feast at the al fresco dining table. Forward on the sundeck sits a spa pool with sunpads and an additional seating area. Managed for charter by Moran Yacht & Ship, Hospitality has a weekly rate starting from $195,000. The 57 metre Golden Yachts superyacht O'Mathilde was launched early in 2018 and can sleep up to 12 guests in seven cabins, with a crew of 12. Below deck she features interiors by Studio Vafiadis, a 70 square metre owner's deck, which comes complete with a private saloon, walk-in wardrobe and a full-beam ensuite. The contemporary main saloon features multiple seating areas and a dining section, a private office, TV lounge and a sleek skylounge. On-deck features include a sundeck Jacuzzi and a foredeck gymnasium. Managed for charter by Atalanta Golden Yachts, she has a weekly rate starting from €220,000 in the low season and €290,000 in the high season. The 57 metre Golden Yachts superyacht O'Mathilde was launched early in 2018 and can sleep up to 12 guests in seven cabins, with a crew of 12. Below deck she features interiors by Studio Vafiadis, a 70 square metre owner's deck, which comes complete with a private saloon, walk-in wardrobe and a full-beam ensuite. The contemporary main saloon features multiple seating areas and a dining section, a private office, TV lounge and a sleek skylounge. On-deck features include a sundeck Jacuzzi and a foredeck gymnasium. Managed for charter by Atalanta Golden Yachts, she has a weekly rate starting from €220,000 in the low season and €290,000 in the high season. 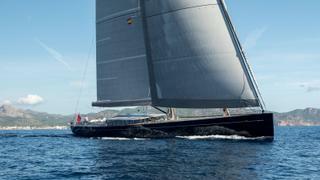 One of the most exciting new yachts of the year, the 73.2 metre superyacht Planet Nine is available for charter. Launched in January 2018 by Italian Sea Group, she features created exterior lines by Tim Heywood and interiors by Mlinaric, Henry and Zervudachi. She can sleep up to 12 guests in eight cabins with a crew of 20. Below deck, her highlights include a dedicated owners' deck, complete with saloon, private terrace, dressing rooms and study, a spacious cinema and a forward observation lounge. Additionally, her beach club has a sea terrace, sauna and steam room. On deck, this ice-classed explorer yacht boasts her own MD 902 Explorer helicopter, hangar and helipad, all available for charter use, as well as a Jacuzzi on the sundeck and a myriad of al fresco lounge and dining spots. Delivered in summer, the 84.73 metre O'Ptasia is Golden Yachts' flagship and is one of the largest superyachts in the world. She features accommodation for up to 12 guests in 11 cabins, with space for a crew of 26. She boasts a spacious sundeck with two seating areas and sunpads, with a waterfall swimming pool on the upper deck aft (surrounded by sunpads) and al fresco dining and lounge spots on the other decks. 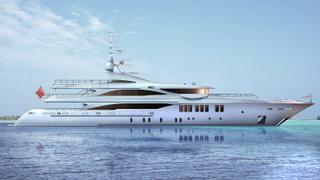 Additionally, she has have an generous swimming platform as well as a helipad forward. Below deck, there's a contemporary main saloon and dining area, a TV lounge complete with a corner drinks bar, a private office and walk in wardrobes off the master suite. She also has a beach club complete with massage room, cocktail bar and steam room, as well as a huge water toy box making her a perfect yacht for charter. 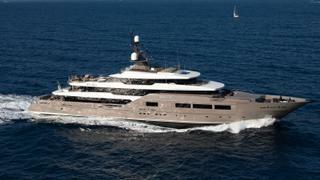 Managed for charter by Atalanta Golden Yachts, she will have a weekly rate starting from €800,000. Delivered in summer, the 84.73 metre O'Ptasia is Golden Yachts' flagship and is one of the largest superyachts in the world. She features accommodation for up to 12 guests in 11 cabins, with space for a crew of 26. She boasts a spacious sundeck with two seating areas and sunpads, with a waterfall swimming pool on the upper deck aft (surrounded by sunpads) and al fresco dining and lounge spots on the other decks. 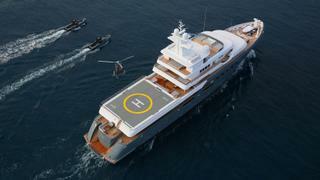 Additionally, she has have an generous swimming platform as well as a helipad forward. Below deck, there's a contemporary main saloon and dining area, a TV lounge complete with a corner drinks bar, a private office and walk in wardrobes off the master suite. She also has a beach club complete with massage room, cocktail bar and steam room, as well as a huge water toy box making her a perfect yacht for charter. 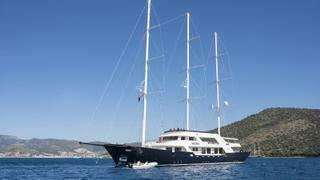 Managed for charter by Atalanta Golden Yachts, she will have a weekly rate starting from €800,000.